Lower the water line. 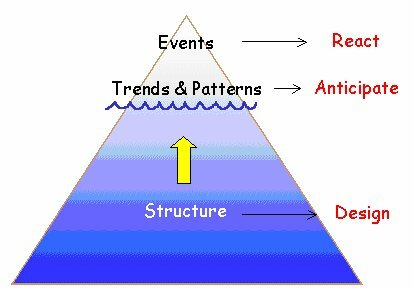 Look beyond single events (the tip of the iceberg) to the patterns and trends that have evolved over time in the system, and the structures (policies, rules) and mindsets that support these. The lower you go, the greater the understanding and leverage. Exercise curiosity not blame. In systems speak, there is no such thing as blame. Systems are set up perfectly to produce the results they are getting. It’s not about finding fault, but rather finding the trigger points for shifting the overall trajectory and internal dynamics. Ask what we tell ourselves that takes us away from fundamental solutions. Often we know what to do to solve a systemic problem (stop eating junk food, get more sleep, invest in capacity building) but don’t because, well, because something else is somehow more appealing (easier, quicker, less cost intensive). Let’s just be honest with ourselves, change course, or stop complaining. Think about the short-term in the context of the long-term. Often we act in short-term ways that inhibit long-term solutions (think food aid that depresses local economies and makes it difficult to invest in sustainable agricultural development). The short-term and long-term do not need to be diametrically opposed. There are ways to align immediate steps with long-terms goals, providing we frame the former with the latter. Expand time horizons. It took a while for us to get into our various messes. All complex systems have some delay and degree of non-linearity between cause and effect. It takes time to understand patterns of behavior, to figure out well-informed interventions, and to understand the implications of our actions (feedback). So let’s stop being prisoners to unrealistic timeframes. Pay attention to what is important, not just what is quantifiable. Often what matters most is hardest to measure. Hope to see you at the conference and surely there will be more to share next week. Thanks for this Curtis. Building on a few of the principles you outline, I would say that it’s important to pay attention to power. Who can make decisions that protect or advance their own (or others’) interests? Who decides who comes to the table in various parts of the system? Whose conceptions of “normal” prevail and what does that mean for those who are most adversely affected by the systems’ dynamics? What’s the dominant paradigm that explains why things are they way they are and how they are subject to change? And, as Donnella Meadows spells out in her work, the highest leverage thing in toc change in a system is the underlying paradigm. So, whose voices are in/out the discussions about shifting the paradigm?